The chalet Nacre is located a few hundred meters away from the Rochebrune gondola. 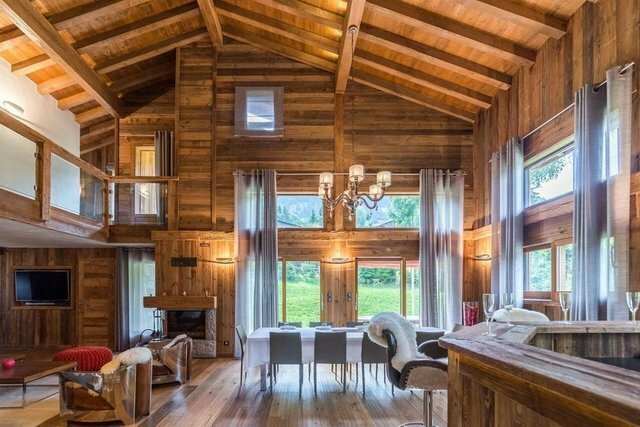 This recent chalet, with a refined style, offers beautiful high ceilings and an apparent frame for a cozy and warm atmosphere. The top-of-the-range services of the chalet Nacre make it the ideal place for your mountain holidays whose key words are relaxation and letting go, thanks to the counter-current swimming pool and the sauna. On the ground floor: the entrance hall provides access to the relaxation area (swimming pool, shower, sauna), the bedroom with shower room, the service room with twin beds and shower room and direct access to the living room. On this floor are also located the garage, the ski room and the boot dryer. The ground floor includes the fully equipped kitchen with central island. The living room and its bar enjoy a magnificent volume thanks to the apparent frame. The large openings let in the light to give the wood a warm color. The dining room is separated from the living room by the fireplace which reinforces this mountain atmosphere. A double bedroom with en-suite bathroom. The terrace and the garden allow you to take full advantage of the calm and the surrounding greenery. On the first floor are the master bedroom with bathroom en suite and a second double bedroom with shower room. Basement: Laundry The highlights of this upscale chalet: - the immediate proximity of the ski slopes by the Rochebrune gondola, - 5 bedrooms with en-suite bathrooms, - the apparent frame that gives the living spaces a breathtaking volume and light, - the relaxation area consists of the heated indoor pool and sauna. Propriété de Megève Sotheby's International Realty, expert in the sale of luxury chalets in Megève.